Edible cookie dough is sweet and delicious! It’s like eating the real cookie dough, minus the eggs so you can eat it by the spoon full or dip it with your favorite snacks. 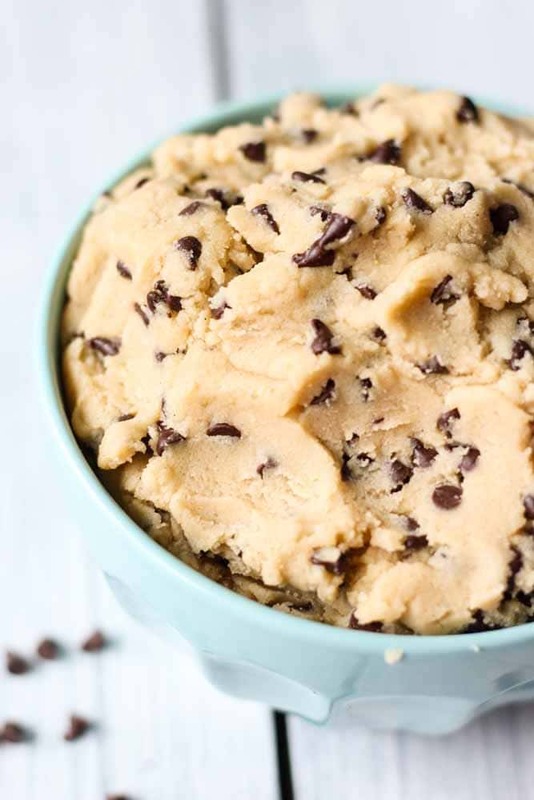 This edible cookie dough recipe is so easy to make because it only has a few ingredients and it takes minutes to come together. Note: This recipe was updated on 2.11.18 with new photos! JUST THINK about the endless ways to eat this edible cookie dough! In cupcakes, in brownies, as a frosting, as a crust layer to ice cream bars or cheesecake, in ice cream, or just plain by itself. There’s really no reason there shouldn’t be a giant bowl of this edible cookie dough in your fridge or freezer at all times. By keeping it on the ready you’re one step closer to an amazing dessert quickly and easily. I know this isn’t a crazy revolution or something you don’t already know, but I’m obsessed with chocolate chip cookies cookies and cookie dough. But who isn’t, really? Of all the ice cream flavors in the world my very first pick would be chocolate chip cookie dough. How do you make cookie dough without eggs? To make cookie dough without eggs you’ll blend all of the traditional cookie dough ingredients together with a stand mixer or electric hand mixer and add milk to bring it all together instead of eggs. You’ll cream the butter and sugar together like you do with traditional cookies when you make edible cookie dough, then you’ll add the flour, vanilla and salt. Because we aren’t baking this edible cookie dough you don’t need any baking soda or baking powder to help them rise. Once it’s mixed you’ll add mini chocolate chips (or sprinkles!) to it and serve with graham crackers, teddy grahams or any of your favorite dipping snacks. It isn’t the safest to eat raw flour. In recent years people have found that faw flour can cause stomach issues so it’s better to heat treat your flour before making edible cookie dough to be safe. How to heat treat: place the flour in a bowl and then place on high in the microwave until the flour reaches an internal temp of 166°F. This takes generally 50-60 seconds. Once you do this you’re good! If you love this edible cookie dough recipe don’t forget to give me a virtual high five by following along on Instagram and tagging #WhatMollyMade to share a picture of your edible cookie dough recipe! Heat treat your flour by placing it in a microwave safe bowl and heating on high for 50-60 seconds until the internal temperature reaches 166°F. In a large bowl using a hand mixer or stand mixer, cream together the brown sugar, granulated sugar, and butter. Beat until fluffy and light in color, about 1 minute. Beat in the vanilla and salt until combined. I’m not sure what I did wrong. I followed the instructions and this tasted NOTHING like cookie dough. Very disappointed. Hey Ally! So so sorry to hear it didn’t turn out. I really wish I could answer this question for you. Truthfully, any number of factors could have contributed to the recipe not turning out as intended: the temperature of the ingredients; if any ingredients had expired; measuring technique etc. I test my recipes multiple times and have used this as a tried and true component to many other desserts. Curious as to what it tasted like? Maybe that will help me pinpoint any revisions or recommendations! Hey Morgan! Very bummed to hear that. This recipe uses the base of my favorite cookie dough just minus the baking soda and milk instead of eggs (so you can eat it raw!). Because it doesn’t have eggs you may notice a slight difference in taste, but the texture should be the same and should still taste like cookie dough. This is so good! We made it on a hot summer day where we didn’t want to turn the oven on. Ten out of ten will make again everyone loved it. Yea, this turned out weird for me too. It didn’t taste BAD, but just not like cookie dough. I just made this cookie dough yesterday and it turned out VERY salty! I put in 1 tsp, but I think it was just to much. It ruined the taste of the dough, but I wasn’t going to waist the ingredients and make it again, so I added it to the ice cream mixture and after it froze and I tasted it this morning, the dough wasn’t bad. I think one of my problems was I used salted butter, it was just to much. The next time I make it, if I use salted butter, I won’t use any salt, and if it’s unsalted butter, I would only use 1/2 tsp. Just a suggestion. Overall the ice cream was real yummy and like I said the dough wasn’t bad. I used salted butter and didn’t add any additional salt. It was amazing!! Hi Kat! So glad you thought so! Happy national cookie day? One of my favorite snacks is cookie dough. Being that I am pregnant, that has been off limits. I made this today for the first time and it is great! I still get my fix! It is really yummy! Hi Sararose! So glad you’re still able to eat one of your favorites! I made this with my 8 year old daughter today and it turned out great. I followed the instructions exactly and it wasn’t too salty or sweet. Will use graham crackers to scoop and eat it. Just the recipe we were looking for! Thanks. Hi Kristie!! So so glad you like it! I’ve used graham crackers to scoop as well. And apples! Thank you so much for taking the time to share. Have a great holiday! This always turns out awesome!!! Try making it with Heath bits and pecans!!! Yum!! Despite others who this didn’t work out for, I thought this was delicious. A little smoother/softer texture than store bought, but the taste is there! Refrigerating before I began scarfing it down may have helped it harden a bit more…haha. I Will keep this recipe! It should be noted that eating raw flour is a risk as well because the flour could contain harmful bacteria. Since there is no actually baking of the cookie dough and no heat to kill the bacteria that could possibly be lurking, it isn’t really safe to it. Commercially made products that contain cookie dough use heat treated flour in their products but unfortunately that isn’t sold in stores. Hi Katie! Thanks so much for your feedback. And really appreciate your concern. When it comes to raw flour you definitely want to be careful. However, you have the same, or larger, chance of eating the same bacteria on fruits and veggies, like a spinach salad for example. I’ve made this recipe multiple times and haven’t had any issues. Hope this helps! You can cook all purpose flour spread on a cookie sheet in a 350 degree oven for 10 minutes to kill any bacteria in the flour, that’s what I always do when I make edible cookie dough 🙂 just make sure the flour is cool before you add it to the mix. Yep you can definitely heat treat the flour! Love it! Have you tried leaving it out a while to soften? It’s likely because the cream cheese and butter have hardened from the fridge. If you let it sit out for around 30-40 minutes it should soften again. This is amazing! My daughter and I had a craving for some chocolate chip cookie dough. I’d never made it before and searched Ponterest. I came upon your recipe and it seemed easy enough. I wasn’t turning out to buy ingredients, so I had to alter the recipe a bit. We only had Lactaid milk in the house ( only needed 2 Tbs anyway) and I had no butter in the house…only margarine. Yes…don’t make fun of me, but we were desperate to cure our craving! I left the salt out because margarine has salt in it. It came out great! When I tasted it right after it was all mixed, I decided it still needed a couple of pinches of salt. So…margarine instead of butter, and Lactaid instead of milk. SEE??? It’s totally HEALTHY!!! LOL! I did stick it in the freezer for about 30 minutes and then the fridge for storage. It’s SO delicious! We divided it into 2 separate containers so we each have our own! It really makes a LOT! Best news ever! So glad my recipe could satisfy your craving, it’s one of my faves. And thank you so much for sharing your subs/swaps I’ll definitely keep those in mind. We actually went to college together so when I found your blog I had to try a few things out! This cookie dough is AMAZING! Keep doing what you are doing! No way! What’s your last name!? Sorry it’s hard to tell through these comment:) So glad you liked it! Did you make anything else? YESS love to hear that! I can’t wait either, Amy! Let me know how it turns out.